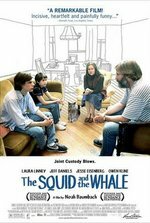 Tonight I went to go see The Squid and the Whale at the Westcott Cinema, in Syracuse’s Westcott neighborhood, right around the corner from where I live. While the Westcott Cinema could desperately use some of the renovation the Palace Theatre in Eastwood has gotten, it isn’t in too bad of a shape. I definetly want to see more movies there in the future, seeing that it’s right around the corner and it generally plays good movies. A couple of weeks ago it screened Wal-Mart:_The High Cost of Low Price, which I unfortunately missed. Anyway, I liked The Squid and the Whale. It had that kind-of “real feel” to it, probably aided by the use of 16mm cameras, and the movie is kind of a tragicomedy, a genre I like very much. The movie has a ton of anachronisms, some of which I noticed while watching the movie. The film was supposed to be set in 1986. Two of the ones I noticed were the U.S. flag on subway cars (didn’t appear until after 9/11), and a Purell hand disinfectant dispenser (didn’t appear until a few years ago). Unlike some people, anachronisms don’t usually anger me, with the exception of that really stupid one involving a video camera in The War of the Worlds, which I mentioned in my hate-rant about that movie this past summer. This entry was posted in Life, Movies by Kai. Bookmark the permalink.